Also this year Oxford Fashion Studio showcased emerging fashion designers giving them the opportunity to be part of the Fashion Week with an opening show in one of the most coveted city, Milan where the opinion on style and trend really matters. Hotel Principe di Savoia hosted the unbridled London event while the 7 designers scheduled on the show enhanced a visual tour crossing cultures and telling stories thanks to a capsule collection for the Spring Summer 2019 season. Straight, oneness, color, culture and innovation are the capsule collections key mood. These central ideas drives us in an harmonious journey through the colorful texture found in the African continent, following the sartorial cut distinctive of Indonesians and again statement pieces and accessories. This visual trip gives us an insight on a new society prospective of the modern woman. Carra Hosiery with her legwears collection gives a classy touch while staying comfy and sustainable. This brand caters to a broad audience spacing from younger to more matured women and even men. Particularity of Carra Hosiery is the in-build pant in its legwears. Africa offers colorful pieces abstract patterned traditional textures and structured models. Fabrosanz, South African and Rwanda Clothing, Rwandan stunned us with collections full of strongness, yet light heartedness showing outstanding women well aware of their roots. Heading east we find Andida Meeda x Jeany Wang and Yurita Puji x Jeany Wang telling us more about culture. Indonesia, sartorial cut and metal details in Yurita collection feels like royalty while characteristically strong colors of the isle and garments embellished by pears in the Andida capsule storytells about tradition. From culture we move to ethnicity with EnnyEthnic. Light garments and multicolors patterns are thought for all women able to bring to life sober eccentricity. 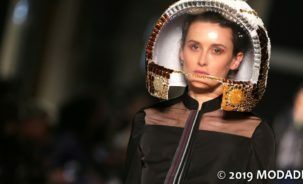 Our cultural and fashion journey gets to an end with Geoj Official participating for the third time on the row to Oxford Fashion Studio show, showcasing a 2019 Spring Summer season made of strong contrast and aggressive geometrics. A mixture of different fabrics, such as faux furs, leather, silk, lurex closes with triumphal fierceness the event.